Kami and Sasu are husband and wife artist duo, both born in Tokyo, Japan. 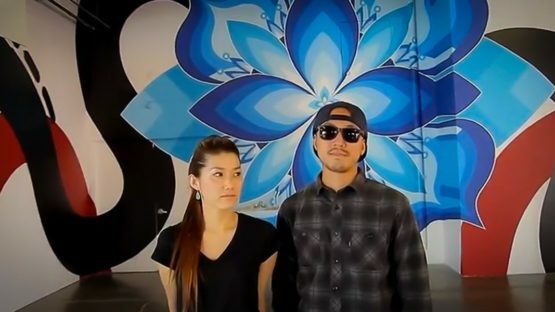 Behind their collaborative name Hitotzuki, they are combining elegant geometry with ebullient, uplifting colors, producing vibrant Zen murals and artwork. The two met and began working together in 1999, after being published in the same free paper and got aware of each other’s work. In 2000 they participated in the acclaimed Barnstormers projects and have since been working and travelling around the globe with their son. Having no formal art education, the two of them experimented through the years in a quest to find their unique, personal style. In a gradual process of trial and error, the wife, Sasu, started creating something like a mandala, putting images in symmetry, shapes next to shapes. Years later, this mandala-inspired shape became recognizable symbol of her work. Inspired by the natural elements around her, Sasu manages to blend her work into her home city’s busy streets. Her murals have a calming, almost meditative quality to them. The name Hitotzuki stands for the sun and the moon, being contrary to one another, they differ yet still fuse together to make a whole. Their work is done dynamically and with freehand. With Kami providing the strong wavy composition punctuated by Sasu’s flamboyant geometric patterns, Sasu best describes this as ‘Kami’s waves are the beat, and my symbol is the melody.’ This vision breathes new life into the sense of beauty derived from the street, and has succeeded in invigorating the era with a steady stream of vivid new landscapes, aimed at expanding the stage for creativity rooted in the dimension of street culture. Kami and Sasu started using blue and black color scheme in 2008. Being comfortable with this blue scale of colors, they are using it since, which is becoming their identifiable and familiar flair. In 2010, they painted two murals. First an installation at Mori Art Museum in Tokyo, called Firmament, afterwards Omni, an installation at Backwoods Gallery in Melbourne, Australia. From firmament, which stands for sky and heavens to omni, meaning ‘all, in all ways or places’, the duo continues their process and progress, a journey through their artworks and inspirations. Kami and Sasu are currently stationed in Tokyo, Japan.